I was so happy with the sweet and enthusiastic replies that I received. How wonderful to hear that my blog buddies also love the idea! A party needs some decoration, don't you think? So for this party I felt like making a little fabric autumn leaves garland. And made a little DIY for anyone interested. It's very easy to make. 1) You can find many leaf templates on pinterest. 2) Use sturdy fabric that doesn't fray too much (for this one I used an old table cloth). 3) Next time I will probably try leaving less space between the leaves and/or stitch them by hand using thicker thread. Right-click on the photo to enlarge. And I'm also sharing with you today some lovely old linen with lace. 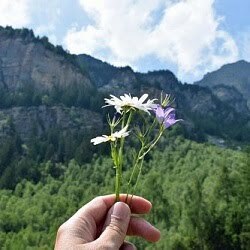 I so loved this photo that I decided to make a blog button out of it. Also because I thought the other one was a bit dark. 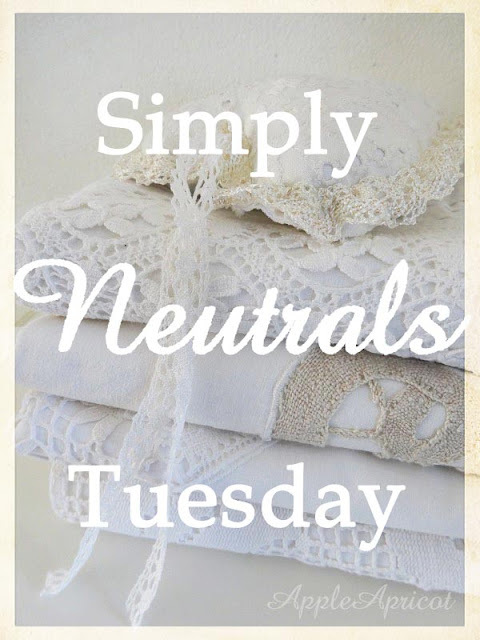 What neutral coloured beauty did you find or make or buy or receive this week? You have till Monday 14th noon CET to link up. Congratulations on your first Simply Neutrals Tuesday party! YOU did it - Yay! It's such a joy to link my post here today and I'm looking forward to meeting the other party goers and seeing what neutral beauty they show us. 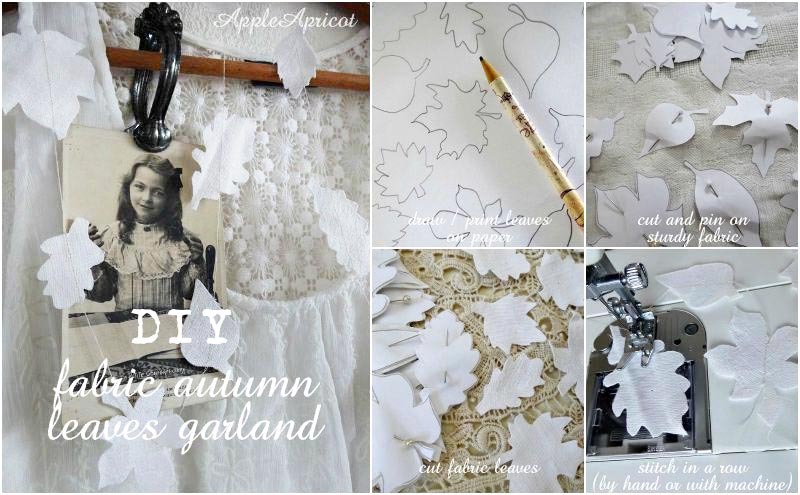 I love your fabric Autumn Leaves Garland tutorial and I can't wait to try my hand at making one - because I live down-under mine will be a Summer leaves Garland ha ha! Ideas are spinning in my head as I write!!! 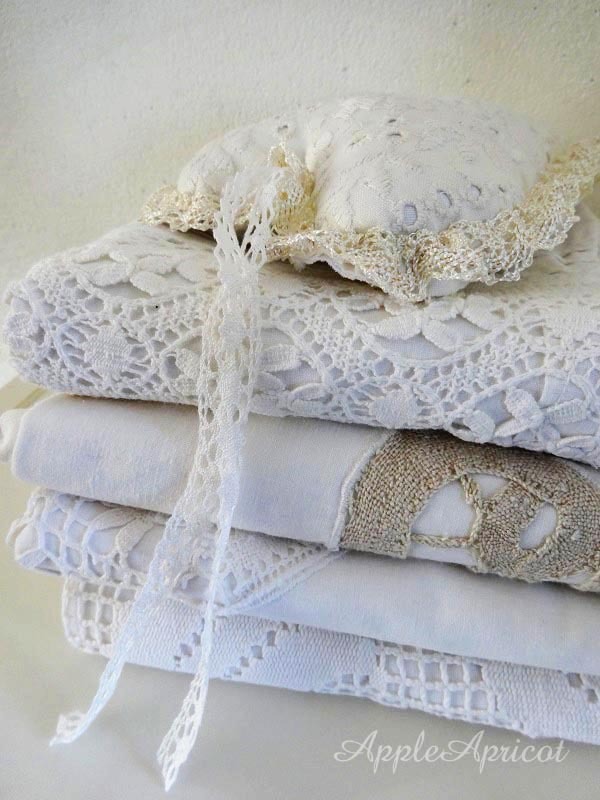 My heart skips beats as I feast my eyes on your exquisite stack of antique linens and lace. Thank you for hosting sweet friend - I'm in heaven! Your falling leaves are so delicately lovely, Wendy. Beautiful project with such soft tone, lovely! Looks so beautiful and you deserve this party to be a complete success. Thank you so much for hosting this party, dear Wendy. The garland is simply lovely. TFS. Congratulations on your first party day! I love your leaf garland, so pretty! I hope I can participate later in the week. Off to check out the other participates! Oh my, Wendy, this party looks absolutely wonderful! I want to join too! I was having a moment of confusion when I didn't find myself among the members, but then I remembered that it was only the other blog of yours I was following. Fixed now. Thank you for hosting a really lovely party! See you soon! I would love to have played along but I haven't been working on anything that's neutral at the moment. Congrats on the wonderful linkie party though and I will be visiting everyone else that linked up. 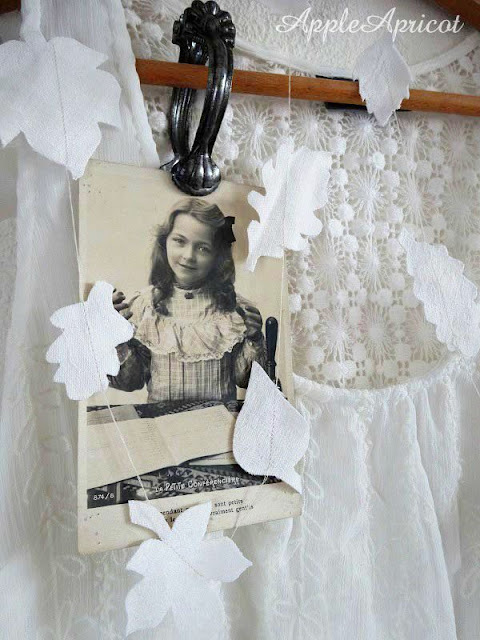 Gorgeous nuetrals, l love the garland you made and what a fantastic idea to use an old tablecloth. It looks so pretty. Dear Wen, what a wonderful party, thank you for hosting it,-I always love visiting you here, and today is such a beautiful visit, too. 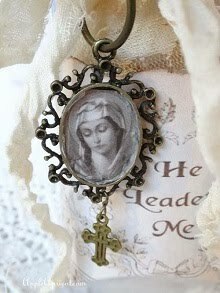 The garland is so very lovely, my dear, and your lace heart on top of the old linen looks amaziNgly beautiful and romantic !! I`m finally home ,after 8 days with my daughter, helping her pack, and paint her new apartment, to where so mooves in the end of the months !! Everything looks so pretty!! I haven't had time to enter yet but I hope too. Have a beautiful day! This is my first ever linky party. Thank you for setting it up. What fun it is to celebrate all this neutral beauty, it really is the best.